I'm interested. Anyone with any customer experience? My 3G iPhone feels like it's on its last legs. Rebooting only helps a bit. Why should it feel so much slower now than the day I bought it? Perhaps because it's constantly processing two email accounts, two calendars, one file share, and two contacts servers including use of CalDAV, Exchange server, and MobileMe protocols. That's atop whatever else I might be doing with the phone. My 3G iPhone is doing a lot of multitasking, and it's hurting. It doesn't have the firepower to handle these demands. Emily's 3GS does a lot better, but if Apple were to enable 3rd party multitasking I suspect it would run out of steam too. I'm guessing we'll get 3rd party multitasking on the iPhone this year, probably requiring special certification by Apple, but that it will only be enabled on the June 2010 phone. More multitasking will require new hardware. Twenty minutes before show time, my PowerPoint 2007 presentation (Sorry kittens) was possessed. I tried adding a drawing item to an image and nothing happened. I couldn’t get the the image to display in the normal slide view. I couldn’t fix the problems, so I gave up and went with what I had. Later I tried to figure out what went wrong. As best I can tell the themes/layout control data had been corrupted. This particular presentation started with a corporate theme as PPT 2003 and had round-tripped between 2003 and 2007 a few times. Evidently, a few times too many. I had to make do with a standard PPT 2007 theme, but I could again edit my presentation. Mahendra, who I will now be following, has written a great summary on using Google Reader. It was all familiar to me, but he cleared up a mystery for me ..
Aha! That explains it. Some of the people I most like to follow, like John Munro, had vanished from my Google Reader "Follow" section but their shared item feed remained in my GR Subscription section. I bet I accidentally clicked "unfollow" (surprisingly easy to do for me). Like Mahendra I'm abstaining from Buzz. Google Reader "People you follow" is much closer to what I want than Buzz. I tried the FCC iPhone Broadband speed app today. I ran it once on WiFi and once on MSP 3G. The iPhone WiFi performance was limited by our home DSL speeds. The 3G download performance was pretty good. The 3G upload performance, however, was really bad. It's comparable to a modem. AT&T's 3G upload is 4% of download performance. No wonder posting images to Facebook, or to Evernote, is so slow. I've been trying to figure out how to manage offsite backup now that Retrospect is a lost cause. I'm using Time Machine/Time Capsule for onsite backup for all of our machines, and testing SuperDuper for an offsite backup of my main machine using an encrypted disk image to work around SDs lack of encryption. That leaves my laptop. Alas, OS X won't mount a networked encrypted sparsebundle image for SuperDuper to use, and I can't backup up my laptop data without encryption. I can, however, backup just my key laptop iPhoto library to a share. Well, turns out Apple Backup 3 still works - at least with Leopard. The current version is 3.1.2. Apple will update old versions, and if you're a current MobileMe subscriber it's still available. Free. Might be just what I need for stuff that doesn't need encryption. Update 4/1/2010: I've now combined scheduled Backup with traveling. Yech. It's stuck on a backup schedule I can't edit and it can't complete. This app never got past beta testing. Update 4/13/10: APPLE SAYS DON'T USE BACKUP. It doesn't really work with 10.5 or later. Thanks, Apple. Update 4/14/10: Ok, now they release Backup 3.2. I'm getting whiplash here! Also, I came up with a workaround for the lack of encryption. I use Backup.app to put a backup of my iPhoto Library on my primary drive, that entire drive is backed up by SuperDuper to a local (USB drive) sparsebundle encrypted disk image. This means my current iPhoto library ends up with two local time machine backups, one local backup on my primary server, one local backup via SuperDuper on an external drive, and one remote backup. Five backups feels about right. The major 3.2 change, besides presumed compatibility with 10.5 and beyond, is recycling. Most significantly, it "improves" restore reliability (kind of scary actually). Update 4/17/10: I've given up on Backup. I believe it can cause an endless SPOD (spinning pizza of death) system hang when it's backing up to a network share and connectivity is lost (ex: laptop goes to sleep, hang on resume). That's an unacceptable bug. I can mount several types of OS X disk images from an AFP (TCP/IP) network share, or even from an iDisk (slow obviously), but not sparsebundle encrypted disk images. I can only mount those from a local drive. This to be a limitation of both 10.5 and 10.6 (Leopard and Snow Leopard). I found a related Apple Discussion thread and an older 10.5 thread on NAS mounting. I was trying to do this as a workaround for SuperDuper not supporting drive encryption. I had hoped to first backup locally to a sparsebundle encrypted image, then move the image to a shared drive which I hoped to then update over the WLAN. That way I could safely rotate my SD backups offsite. This doesn't work. We really need SD to support encryption. It's a Snow Leopard bug. If you enable MobileMe Snow Leopard tries to authenticate with a remote machine using the MobileMe name instead of a username. I think it's some version of a directory service; in theory it probably lets you easily connect to a remote account with the same MobileMe credentials -- even if has a different username and password. It fails, however, if you try to connect to a share with a different associated MobileMe account. When this bug hits you can't use the normal "Disconnect" or "Connect As" features. Editing the Keychain doesn't help. You can try clicking "Connect As" very quickly after Disconnecting and it might respond. If you turn off MobileMe then you can connect and disconnect normally and the "Connect As" feature works. If you turn MobileMe back on the bug returns. If you save files using this MobileMe authentication scheme on the remote share I think you may run into ugly permissions problems (such as 45,000 0 length files this evening on one failed write attempt). See also: Gordon's Notes: Tech churn 2010: How do you share a family file? Update: There's a Take Control book on permissions due out soon. The announcement blog post sounds ominous. I'm going to buy that book, I'll ask the author to check out this MobileMe bug too. Since Apple last updated their troubleshooting permissions document in 2008, and their screen shots go back to 10.2, the author has his hands full. Update 3/11/2010: Given my recent experiences, I decided it was time to migrate Emiy's account to the new machine, and clean out the old accounts. I did a firewire migration and it went very quickly. After verification and testing I deleted her account on the old 10.5 iMac. On restart my old account on that machine had her user name, but all of my content. So the permissions were more than a bit screwed up over there. I deleted that account as well. The OS X file security mechanism (aka "permissions") was archaic eight years ago. Now it's the living dead. The somewhat less decayed alternative is to use OS X Access Control Lists (ACLs). They are not widely used, though some geeks use them to share media collections among multiple machine accounts. (This kind of file sharing is not otherwise possible  without hacks that remind us that OS X is a dying desktop solution). Allow the Retrospect Client to examine Access Control Lists (ACLs) on Intel Macintoshes. This may cause Retrospect to freeze due to a defect in Apple's implementation of ACLs. EMC's products are notoriously buggy, so I suspect "freezing" rather than, say, throwing an error message is an EMC bug. On the other digit, however, I believe them. This feels true based on my own experiences, and it confirms a hunch of mine that one should avoid ACLs. Of course this is a good general principle -- don't use features of operating systems and software that are not widely used. A corollary is that you shouldn't consider uncommonly used features when evaluating modern software -- they probably don't work. Last April Tidbits claimed iPhoto '09 does enable multi-user sharing. It is, however, still undocumented by Apple and thus risky. Even so, I might give it a cautious try once I happy with my 10.6 backup solutions. I'm not happy yet. It took me fifty years to learn to tie my shoes. So it's not surprising that it took me months to figure out how to use the "simple" iPhone Voice Memos app. I doubt many users could have as much trouble as I with an app that seems to have only two buttons, but if you're one of the chosen this is for you. To begin with, I need to explain the wrong way to use the app. The wrong way is to tap the red button to start, then tap it again to stop. Wrong. Than puts you in pause mode, and to quit recording you might next tap the right side black icon, then go to another screen, then tap the Done icon and so on. Here's the right way to use the app without an Apple headset. Headset instructions follow. 1. On startup you tap the red button to record. (Ok, I got that far.) 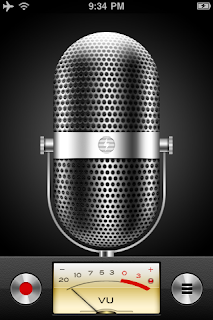 You need to hold the microphone reasonably close to your mouth, the app isn't designed to be used for recording lectures and the like -- just for voice memos. 2. Ok, here's the trick. While recording the red button has changed from a circle to two parallel vertical red bars. It's a pause button. What you might miss, because your eye has been pulled to the red button, is that the odd "grill" button (3 black horizontal bars) has also changed. It's now a black square. 3. When you're done, don't tap on the red pause button. Tap on the right black button. Yes, the one that used to be 3 bars but now, if you're paying better attention than I, you will see is a black square. Tap the black square and you're done. 3. What happens if you tap the red button? You go into Pause mode. Pause mode looks just like start mode, except for the big red top banner that stays on whatever you do on the phone. In Pause mode the black button is 3 horizontal bars. Now if you tap on the (multimodal, nefarious) black button you go to review mode. 4. In review mode the app will start playing back your last recording. You can click Done to stop and quit or you can play or delete your saved recordings (swipe to delete). At the point you can see that if your intent is to record and stop, then hitting the red button while recording is a mistake. It puts you in pause mode, and exiting from pause mode involves several precision taps. If you're dictating while driving, this is dangerous. If you fall into the pause trap, your best option is to tap the red button again to return to record mode, then tap the black button to exit. There was, I thought, only one good feature of Voice Memos.app. It's fast. iTalk Lite had great features, but it was too damned slow to launch and record (I'd have paid for the pro version if it were five times faster). ... PS. There is Apple documentation on some of the microphone switch's features. You can use it, for example, to decline an incoming call (hold 2 seconds) or to switch and hold (click once) or switch and kill (hold 2 seconds). No mention of Voice Memos.app though. My mothers modem lights were flickering madly -- but I couldn't see why. All was quiet. It wasn't just the lights -- the network performance sucked. Sometimes things would rush down, but at other times they'd just hang. Crazy. Naturally I blamed Videotron. Nice people, but last time we had a problem they had to replace her router twice. As usual I got an agreeable support person. Everything tested out for him, but I couldn't run the Videotron speed test - it took ages to load. He wanted to test further, but I thanked him and told him I'd check things out internally. You see, I'd lied to him about not having a router installed. Yeah, that's bad. I felt guilty because once he'd confirmed their network was ok I had a hunch where the problem was. I turned my suspicions to the other machines on the WLAN, including my MacBook. Sure enough, when I shut the MacBook the modem lights slowed down and the Videotron speed test showed 1mbps downlink and 128K uplink - just what Mom pays for. It's geeky, but, in short, LittleSnitch worked. The culprit? MobileMe iDisk file sync. If you have a local cached version of your iDisk share OS X Sync is very demanding about synchronizing with the remote MobileMe iDisk. I wouldn't notice this at home, but at my mother's OS X Sync was saturating the 128 kpbs uplink trying to sync a 28 MB file. The only clue to what's going on is a spinning icon seen if you view a Finder window sidebar. Turning off MobileMe sync doesn't stop this. You can only stop it by clicking on the spinning icon or by turning off local disk caching altogether. So I was wrong, I did have malware. Apple malware.